My interest in the Mormon religion began when I moved to west central Illinois, not far from two of the more sacred places in the religion – Carthage and Nauvoo Illinois. My interest deepened when I married into a family who actively practices in the church which is now called Communities of Christ, formerly the Reorganized Church of Jesus Christ of Latter-day Saints. Because one cannot understand the basis of the beliefs held in the Communities of Christ without understanding the origin of their beliefs – Mormonism prior to the death of Joseph Smith in 1844, my layperson’s knowledge of Mormonism grew. And once you begin to delve into the history of the Latter-day Saints you cannot help but understand the essential role that geography plays throughout the history of this religion. As a map librarian and a geographer, I have been looking forward to reading Mapmakers of New Zion since I first learned that it was being written, and it delivers. The reader does not need not be familiar with Mormon history or have an interest in it to appreciate this book, as Francaviglia does a superb job of recounting the history of the Church of Jesus Christ of Latter-day Saints in a straight forward manner. Using maps to illustrate important points in Mormon history, he writes a comprehensive, easy to read history of, arguably, one of the America’s most misunderstood religions. The book is text heavy and through the stories Francaviglia uses to illustrate the history, it can at times also be very dense. However, the maps used to highlight various historical points along the way break it up and aid in visualizing the geographic nature of Mormonism. Mapmakers of New Zion is more than an overarching history of Mormonism. 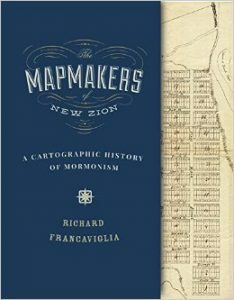 The title tells us that it is a cartographic history of Mormonism, but I would say that it is both a book about the cartographic history of Mormonism and an informative read on the history of religious cartography. In the introduction and conclusion, Francaviglia delves into discussions on mapping the sacred and maps, religion and power with an interesting aside on women in cartography in the conclusion. Sandwiched in-between these two pieces, he discusses the role cartography has played and continues to play in Mormonism. From the use of maps in the expansion of Mormonism over time and the mapping of places named in the Book of Mormon to Mormon map making, it offers a comprehensive look at not just the cartographic history of the religion but also of the role Mormonism played in shaping the American West. What makes this volume stand out from other atlases or cartographic/geographic histories on Mormonism is the utilization of material from the LDS archives. Since Mormonism is such a young religion researchers have the luxury of being able to utilize texts and documents from all stages of its formation and growth. Throughout the book we get a glimpse inside the historical records of the Church of Jesus Christ Latter-day Saints and more importantly for those of us specializing in cartographic collections, we get a glimpse of some of the cartographic artifacts held in those archives. A few interesting highlights come in the first chapter with the discussion of the “City of Zion plan”. Utilizing design ideas based on the utopian ethos found in the Bible, Joseph Smith had a vision to build Mormon communities based on a four square, compass oriented grid system. Francaviglia chose a series of three early manuscript maps from 1833 illustrating different versions of the “City of Zion Plan” as Smith envisioned. He also includes maps of places which are central to Mormon history but otherwise unknown to most of the rest of the world – two maps of Kirtland, Ohio in 1833 and 1837 by Frederick Williams, an early 1840 map of Hancock County, Illinois showing the location of Nauvoo. Throughout the rest of the book there are more pieces, both cartographic and otherwise, from the LDS archives giving readers a tiny inkling to the rest of the treasures that surely exist within. Mapmakers of New Zion adds long overdue depth to the literature on mapping in religion with its focus on the Mormon religion. Additionally, I believe it adds to the literature on utopian cartography and mapping in the American West. I recommend it for collections with a focus on the history of cartography, strong collections on the American West and Religion or for any individual looking to read a history of the Church of Jesus Christ of Latter-day Saints from an interesting perspective.